The Polish Jinx: China Glaze Cirque du Soleil Worlds Away Winter 2012 Collection. China Glaze Cirque du Soleil Worlds Away Winter 2012 Collection. So this collection SHOULD be out November 2012.
wow, those are cool, I want the top 2 and the last one! I definitely want whirled away! 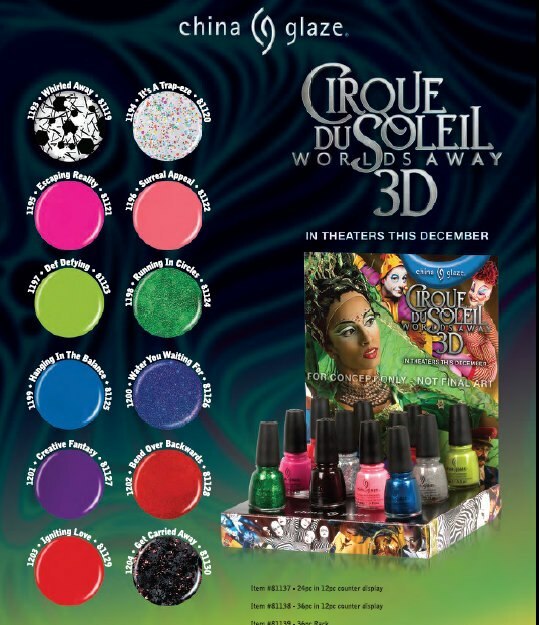 Plus I work for Cirque Du Soleil currently so that is super cool that they are coming out with a nail polish collection even if it isn't specific to the show I am a part of! It's out and it's GORGEOUS. I missed picking up #1202 Bend Over Backwards...but I have to say, I'm impressed.